Effect of spin-orbit splitting can be observed for phosphorus elements and compounds. Apparent resolution of spin-orbit components varies between compounds, e.g., P2p3/2 and P2p1/2 components are clearly visible for some phosphides, but for phosphates, an asymmetric peak envelope from overlapping components is observed. 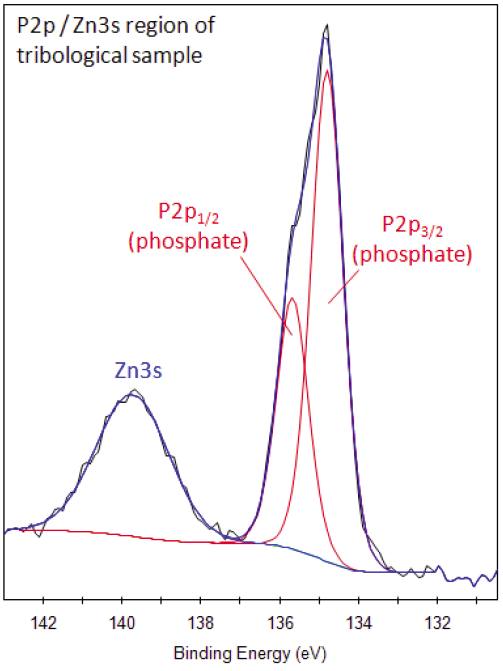 When zinc is present, be careful not to misinterpret Zn3s peak as phosphorus chemical state. Many glass materials contain P, as phosphate. Phosphorus was discovered by H. Brand in 1669 by heating concentrated urine, producing a snow-white substance that illuminated in the dark. 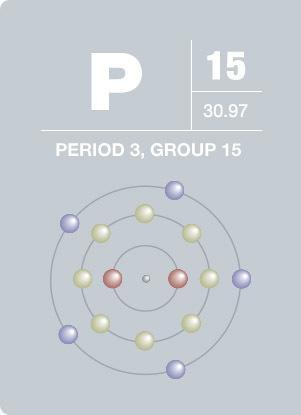 Named from the Greek origin “phosphoros,” meaning light-bearing, this element is an essential component of living systems and is important in agricultural and industrial applications. Phosphorus exists in several allotropic forms: white, red, and black, each of which is employed in a variety of applications including fertilizers, detergents, and steel production. Pure phosphorus is colorless and transparent, but ordinarily exists as a waxy white solid. Phosphorus does not exist in the environment in its pure form, and is most often found as phosphates.